Mix king oyster mushrooms with olive oil (1 tbsp), then lay them on a greased baking tray and bake at 130oC for 20 minutes; remove and let cool. Heat vegetable oil over low heat and saute soya mince plus ground black pepper (1/4 tsp) until golden brown; remove and set aside. Lightly fry peanut butter and tahini with olive oil (1 tbsp), add in baked king oyster mushrooms, black pepper coated soya mince, lemon zest, all herbs, all seasonings and water; stir well, cover and simmer until the liquid is fully absorbed. Then, add ground golden flax seeds, tapioca starch and ground black pepper (1/4 tsp); mix well, remove and let cool. Heat sufficient amount of oil for frying over medium heat. Smear some oil on both hands, scoop out a spoonful of the vegan meatball mixture and roll into a ball shape; repeat until all the mixture is used up. Fry the vegan meatballs until golden brown, remove, drain and serve. note: you can also freeze the vegan meatball mixture for later use. 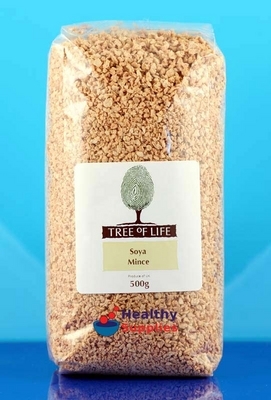 Hi Sonia, here’s a reference > http://www.healthysupplies.co.uk/pics/400×400/soya-mince-500g-tree.jpg, you shall be able to find it in some organic shops, thanks!